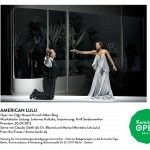 The socially aware agenda of the Komische Oper’s new Intendant Barrie Kosky has been ruffling the feathers of Berliners months before he officially took over this season, not least with the decision to end the house tradition of performing operas exclusively in the German language. His emphasis on cultural pluralism aside, the program so far should assuage any fears that the native Australian will create a rupture with the opera’s hallowed emphasis on reinventing opera for contemporary audiences. 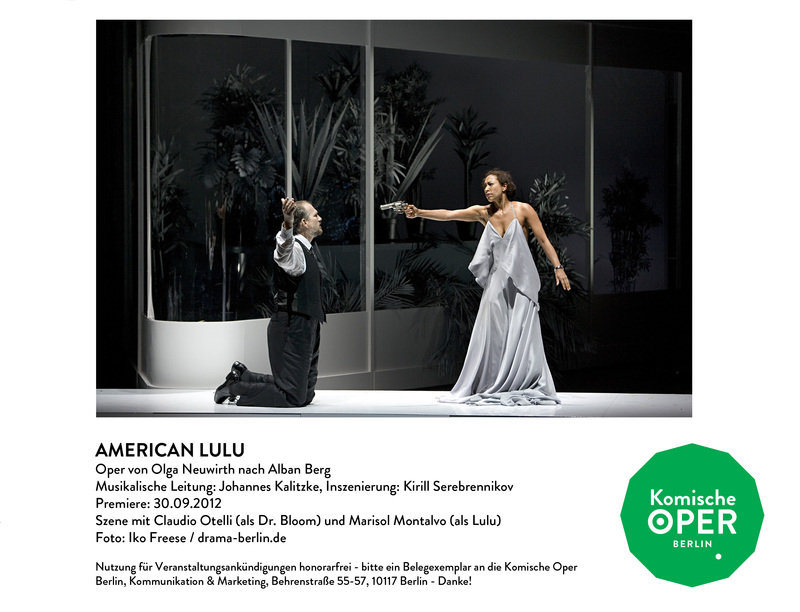 Following a 12-hour Monteverdi trilogy as rescored by Elena Kats-Chernin and staged by Kosky, the intendant has unveiled the world premiere of Olga Neuwirth’s American Lulu, a shortened, updated version of Berg’s incompleted last opera. It is either ironic or a sign of historic progress that Berlin, where Nazi politics once thwarted a full staging of the work, has mounted the second new Lulu in less than a year. The Staatsoper presented the work with a recomposed third act by David Robert Coleman last spring when a new production by Andrea Breth made it legally impossible to use the standard reconstruction by Friedrich Cerha. Almost foreshadowing Neuwirth, Coleman drew upon the jazz band of the First Act for his orchestration, thinning out textures to a chamber ensemble including marimba, steel drums cowbells, and banjo. American Lulu (seen Oct.6) takes the thematicization of jazz a step further, setting out to reference Afro-American culture in everything from a steam blown organ ballad to a trumpet which emerges as a symbol for the blues singer, Eleanor (a curly haired, less feudal characterisation of Countess Geschwitz). Neuwirth resets passages of Berg’s original music to the first two acts for brass, woodwinds, a small set of strings, and percussion as well as electronic guitar and piano, in some places adding contours to Berg’s expressionist lines with the deeper timbres and expanding the sonic space with recorded sound. By contrast, her entirely original third act emerges as an unsure blend of quasi-minimalist textures, jazz-band brass, spectralist fades and raw, avant-garde string textures. The English-language libretto is redevised in a similarly awkward fashion. The story begins and ends in an upscale New York apartment, traveling through New Orleans, where Lulu is living with the painter—here a photographer. Dr. Schön is instead Dr. Bloom, who kills Lulu’s lover by throwing ice at him. She flees with Bloom’s son, Jimmy (a stand-in for Alwa), becoming a high-class whore to a white banker and rebuffing the advances of Eleanor without remorse until she is killed by a stranger. Neuwirth also inserts an unidentifiable, pimp-like character named Clarence, who upbraids Lulu for being so “damn insatiable.” Recitations about black rights and other poetic musings emerge perplexingly through the speakers between acts. The racially conscious goals of the production mostly came across as clichéd, but it had to its credit Marisol Montalvo in the role of Lulu, able to nail her high notes and move seamlessly into Sprechgesang as she cavorted in everything from lingerie to Brazilian tassels. Despite the high dose of eroticism, her dramatic portrayal did little to convey the danger of a femme fatale, which can also be attributed to the limited scope of her character in Neuwirth’s libretto and stilted direction by Kirill Serebrennikov. In the role of Eleanor, Della Miles performed with saucy poise, coaxing the orchestra of the Komische Oper into her R&B inflected grooves. The male roles were well-cast but not outstanding. Jacques-Greg Belobo gave a smooth-voiced delivery of Clarence, and Austrian baritone Claudio Otelli was an imposing Dr. Bloom. The bass Philipp Meierhöfer was in fine form as the Athlete, and Rolf Romei made for an earnest Jimmy, including when he cracked into the higher range. German conductor Johannes Kalitzke balanced the score’s wide-ranging demands with a steady hand. Sets and costumes by Serebrennikov provided a stark backdrop for Neuwirth’s modern fantasy but ended tastelessly with a bloodied picture of a murdered Lulu. Conventional black-and-white video projections by Gonduras Jitomirksky similarly did little for a production whose progressive aspirations fail to match up with its artistic standards. Perhaps Lulu was never meant to be a vehicle for racial mobility after all. This entry was posted on Friday, October 12th, 2012 at 4:54 am	and is filed under Berlin Times. You can follow any responses to this entry through the RSS 2.0 feed. Both comments and pings are currently closed.